Good quality scans and will normally go through a whole stack rather quickly. Included software is excellent with many different options and is very helpful for document management. Good quality and price for a small business. The Canon DR 5010C has fulfilled all our requirements. The speed and quality is impressive and allows us to scan varying size documents up to A3. As far as I am aware we have had no major problems with the scanner. The only thing is that sometimes only every other page is scanned. Apart from that everything is fine – the quality and speed of the scan is great. The DR-5010C handles all documents smoothly, from large A3 pages down to the smallest cards. Plastic, cardboard, thick and even very thin paper pose no problems, thanks to the special straight paper path, which is incorporated in addition to the U-paper path. 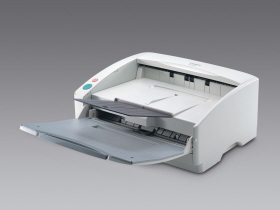 While the DR-5010C's dual feeding mechanism ensures reliable document feeding, a range of other features mean you can rely on seamless unattended scanning. Text orientation, Automatic Paper Size Detection, Skew Correction and Skip Blank Page give the results you want, with no wasting time waiting by the DR-5010C. A new 'Rapid Recovery' system quickly resumes scanning after any errors. Capture the most intricate image details with an optical resolution up to 600 dpi. The 3-line CMOS sensor enhances colour quality while eliminating the problem of colour staining. A special 3D colour correction function faithfully reproduces colour information by pinpointing the exact RGB colour coordinates. Optimise the legibility of hard to scan documents with faint text or dark backgrounds with the text enhancement and black and white contrast features so you always get the best results. The DR-5010C's 'remove punch holes' function automatically whites out black dots when scanning documents stored in binders.